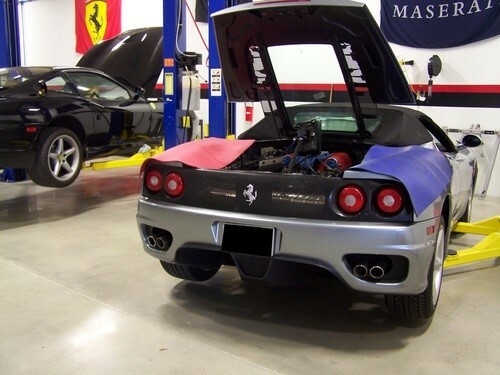 From basic repairs to full exotic car restorations, Rosso Service is Pennsylvania's best exotic car service center. To schedule repairs or maintenance in West Chester, PA, call our team at 410-638-AUTO (2886) today or fill out our contact form online! We will pick up your car at your West Chester home and transport it safely to our state-of-the-art repair shop to perform service, then return it safely to you--hassle and stress free! Our owner, Scott Lankford, has more than two decades of experience in the auto industry with more than 14 of those years specializing in Ferraris and other Italian exotics. As crew lead at Scuderia Ferrari of Washington for eight years, Scott has seen and repaired it all, so trust that when you come to Rosso Service for Ferrari repair in Pennsylvania, you are putting your car in the hands of one of Pennsylvania's most experienced Ferrari technicians. Beyond the brands listed above, we service other high-end exotics, sports cars, and luxury cars. Rosso Service’s experts offer diagnostic, maintenance, and repair services for Ferraris, Lamborghinis, Maseratis, Porsches, Bentley, Aston Martin, Lotus, Alpha Romeo, and more, including the Lamborghini Gallardo, Lamborghini Murcielago, Lamborghini Huracan, Lamborghini Aventador, Maserati Ghibli, Maserati Quattroporte, Ferrari 360, Ferrari 355, Bentley Continental Gt, Bentley Flying Spur, Ferrari 458, Ferrari 456, Ferrari 488, Ferrari 430, and more. Trust the professionals at Rosso Service for all your exotic and luxury car needs in West Chester. If you are looking for an exotic or luxury car service center in West Chester that you can trust, give us a call or fill out a contact form today to discuss your needs, or schedule an appointment for your luxury car repair, service, maintenance, or restoration needs.